There are many subjects that need to be explored so as to gain a greater understanding of higher realities. One notable matter that requires our attention is the suggestion that human beings have an energy body, one that can enable us to ascend into higher dimensions. Perhaps a good place to start this exploration is with a Russian engineer named Semyon Kirlian. Way back in 1939 Semyon was busy repairing an electro-therapy machine in a research laboratory located in his town in the Ukraine. He was being a little to careless and his hand strayed near to a live electrode, he received a shock, but he also witnessed a flash of light. He was struck with the curios idea that it would be interesting to place a piece of light sensitive material in front of a flash produced in this manner. He placed some suitable material between his hand and the equipment then photographed the subsequent burst of light. The developed image was really quite extraordinary, it showed streamer-like emanations coming from his fingertips, each emanation had its own unique radiation pattern. Fascinated by his findings, Kirlian began to dedicate much of his time to a home based investigation of the phenomenon. Over the next 40 years his high voltage photography produced much scientific speculation and even some claims that he had proved the existence of an ‘astral body’. The ‘astral body’ is purported to be an energetic overlay of the physical body, holding a great deal of information about a person, it had been claimed to exist by mystics and clairvoyants for many centuries. Their also existed claims that some gifted persons had the ability to see this astral body as a aura of light surrounding the physical body or a halo of light about the head. This purported energy body is, for all intents and purposes what might be called the spirit by many folk, that aspect of a human being able to survive death. Whether Kirlian had photographed the spirit or some other strange phenomenon, is of course a matter of some debate. Others replicated his results however and indeed made new discoveries. The English researcher George de la Warr found that a lattice-like formation of electromagnetic force fields surrounded the body up to some distance. It had peaks of as much as 70 milli-volts, although fluctuating, usually with the emotional state of the subject. This grid pattern observed rather reminds one of the Chinese and Indian maps of energy lines around the body used in their ancient traditional methods of healing. Kirlian noted that the presence of illness or disease had a direct effect on the energy field he was photographing, when taking a picture of himself just before a very virulent attack of influenza he found that hardly any image resulted from his attempted photos. This finding was reinforced by a blind test initiated by a respected head of a scientific investigative unit, two leaves were photographed by the Kirlian method, yet, one lacked the characteristic energy patterns. It was later revealed that this leaf was from a plant that had contracted a serious disease. Other interesting findings were made when small parts of leaves were imaged, these gave pictures showing ghostly images of the complete leaves in outline. It was as though the remaining parts somehow retained the energy field make-up of the original whole unit, rather suggestive that a holographic principle was at work at the energy level of physical life. This finding reminds us of so-called `phantom limb syndrome´ as felt by many limb amputees, this being where the persons experiences sensations or irritations felt to be in parts of the body that have already been removed. Although over the years many people have stated that the findings of Kirlian photography experiments are proof of the existence of an Astral Body, Kirlian never did so himself. Indeed many mystics argue against this suggestion, stating that the images he recorded do not represent anything like the subtlety and complexity of the imagery they can see when directly observing the human aura by psychic means. Unfortunately a scientific investigation seeking to prove this matter either way would be incredibly difficult, things seen by psychic means are not easily analysed or quantified by any objective methodology. I know from my own experiences in viewing the human aura that the energy patterns observed are not always easily described. It is not something that lends itself to a laboratory investigation, at least not by any scientific tools I know of. That said I firmly believe that auras can be seen by anyone, if after just a little preparatory training. As with most human abilities we are not all equal in psychic gifts, some will not see as much as others, and some small few will sense a wealth of information present in that field. Aura reading is quite an astonishing skill, I recall a friend of mine at university giving me astonishing details about my character and regarding people that I often interacted with, such as my family and friends. Thus though the saying is that `a picture may say a thousand words´ in the case of Kirlian photography it actually misses a great deal of the information available to the ones among us with strong second sight. Theories based on Kirlian’s study continue to bloom and be argued over. Everything from biological plasma to species specific energetic templates, named morphogenic fields, have been suggested. Whether these images really are a spiritual phenomenon, which seems to be possible, they remain of great of interest to any person seeking the truths of human existence, especially when we consider that these imaged have been used to help diagnose illness and emotional problems. Whatever it is that Kirlian stumbled onto, he revealed something highly interesting and potentially very useful. I would like to interject at this point a comment from a friend of mine, a globally respected Historian of Science, who feels that the human aura is actually evidence of Quantum blending. The aura being an area in which the organism blends with its environment at the quantum level. Something I must admit I find quite plausible and worthy of later analysis in a separate investigation. 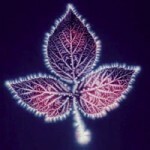 Though the images produced by Kirlian photography are fascinating, they are certainly not the only part of the story. I have personally found some other interesting avenues of scientific exploration that seem to help us understand how an aura around a living being might be produced. Further this additional material may help explain the extremely realistic imagery, often considered to be mere hallucinations, commonly observed by visionaries and shamans or by persons using etheogenic and hallucinogenic compounds. We should consider here that the claims made by indigenous peoples and by many modern mystics regarding these intense luminous images are that in some instances they are part of a direct communication with animals and plants. Reminiscent of our mentioning earlier that certain persons can read information from the human aura. It seems that the aura and some of the mind bending visions seen by shamans, have significant overlaps regarding information transfer properties. What is the common factor here if not the presence of light, some form of organised light not witnessed by all persons present to the events. There is an interesting annual event in that part of North-east Thailand through which flows the might Mekong River. Once a year, for several days, pilgrims make their way to the banks of the Mekong to watch the ‘Naga fire-balls’ emerge from the river´s surface. This phenomena has been witnessed, and even recorded, by many people but is as yet not adequately explained. Unless of course you are that type of person only to happy to ascribe all of the thousands of UFO sightings to the presence of hot-air balloons or meteors, in which case you will be happy with the current weak explanation of these balls being swamp gas and fireworks (I suggest watching some of the videos). 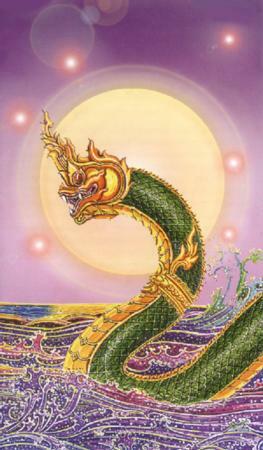 Many of the observers, as well as a great number of those resident in that region, claim that there is a Naga serpent living in the Mekong River, and that it is this being that shoots the fireballs up out of the water. A Naga is a mythical beast, at least at present, purported to live in the bottom of some rivers and lakes, but able to fly if it wills, as well as able to perform great feats of magic. For the moment I will make no conclusion in this case, rather I would like to move from this macro-cosmic fireball shooting water snake, to one at a microcosmic level. 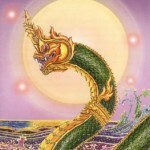 Perhaps there is a scientific origin to the Naga story, could it be the residual knowledge from some lost ancient understanding of reality, irrespective of what may or may not be creating the afore-mentioned annual display. I believe that there is a Naga serpent of sorts residing within us all. It is my suspicion that this impending revelation might explain to us this business of us having a light body, and the method by which mystical visions can allow plants and animals to communicate with humans. So now let us finally meet this little serpent that lays coiled in water, shooting out particles of light. For those of you that have not yet guessed its identity, it is of course deoxyribonucleic acid, better known as DNA. 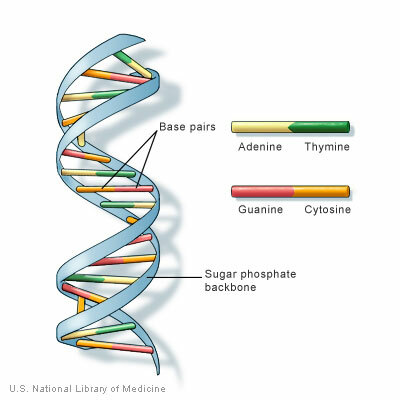 DNA actually exists as two strands of material coiled about each other within the nucleus of a cell, this structure is called a double helix. There are equidistant bridges between the two strands, these are called nucleotides. DNA carries all of the information for life, carrying that information on to offspring along the chain of progression we know as evolution. These serpentine strands of genetic information reside protected within water, enclosed within the cell membrane. Much of this is very well known of course, but less known is the fact that these coiled snakes are constantly putting on a fascinating light show. Even back in the 1980s it was being shown that the cells of living matter were emitting photons at around 100 units per second, per square centimetre, and that DNA was the source of this light. The bandwidth in which this light is emitted is, quite amazingly, within the extremely narrow band we know as visible light. This is a range of frequency between infra-red and ultraviolet. In all fairness we would have to call DNA a very weak light source, not bright enough for our eyes to observe in any normal circumstances, it is however very regular and consistent, this makes it much more akin to the focus of a laser-beam than to the erratic outpourings of a light-bulb. We must bear in mind at all times here that we are dealing with accounts from persons that use special techniques of altering consciousness, those who use psychoactive substances and others that simply have the innate ability to see more than normally perceptible. This is an important point to make, as it is easier to be cynical about those accounts involving chemical compounds, but not so easy with those that do not. It is known that when certain chemical production process are stimulated within the human body, such as by by hallucinogens or meditation, these stimulate specific receptors. A cascade of electrochemical reactions begins within the neurones of the brain, this process can then excite DNA causing an increase in its production of light on the visible wavelength. Seemingly then it is this light from DNA that interacts with the surrounding world and is somehow responsible for the images perceived as what we call hallucinations, these holographic type images. As a graduate in Information Technologies, this use of light as a communication method in nature seems eminently sensible to me. 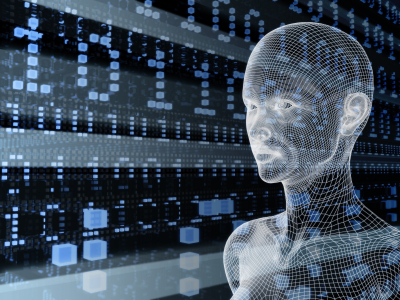 Encoding information to be sent by light is one of our civilisations chosen methods of communication. Not only do we already utilise fibre optic cabling and infra red, but also NASA and SETI space programs admit that any advanced civilisation would be far more likely to send out messages into space encoded into pulsed lasers, rather than by the inefficient radio waves we have used. Is it then that a communiqué from DNA itself is being perceived interpreted by some aspect of the human unconscious in altered states of consciousness. Thinking speculatively, I would suggest that perhaps the increased light production brought about during such states is rather like a phone call going out to any surrounding consciousness in the immediate environment, with the complex hallucinations being the reply. In this harmonic matrix of light, meaningful messages can be perceived by the mind from within the structure of the imagery. The images are essentially information encoded light, or information sent by means of pulsed lasers. This could be the chosen method of communication between all the different life forms resident on Earth, but for some reason only certain sensitised humans are plugged in to the grid. We are left to wonder whether it is then a case of needing to amplify this laser information coming from DNA, or a need to improve our sensitivity to it. I imagine if we were to find a way to do both we would learn incredible things about the fundamental existence we are a part of. Imagine a 100% clear and reliable method of inter species communication. Of course some of this is still at the level of educated speculation, but all of it is very fascinating none the less. My study suggests a world largely made up of the production, interaction, and reception of these photons coming from DNA. There is actually one existing scientific model for the functioning of our fundamental reality that might well mesh well with the suggestions I am putting forwards. The theory I have in mind is the Holographic Paradigm Theory, already subscribed to by some of our most eminent modern science minds. Holographic theory of reality is a topic I will try to elucidate at another time, as it certainly deserves more than a footnote here. I welcome any feedback on this investigation. The colour patterns emitted by DNA carry the code for gene position and connections during the construction of the individuals unique identity and are carried by the spark of life transmitted to the egg by the sperm the moment they touch even before their union so bioelectromagnetism is the method used to carry the code for life.